Self Directed visits are an excellent way to get your students engaged in marine life, with the flexibility to customize your day in a way that works best for you. 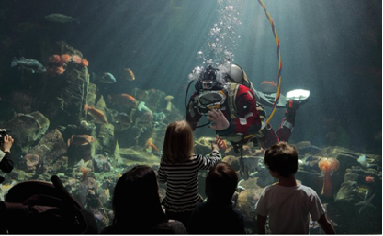 The Vancouver Aquarium is home to over 5,000 animals of over 750 different species. There are endless ways to imagine your day. This page is a asset for you to use throughout your Self Directed Visit. Here you will find resources for planning your visit, activities for your students, as well as follow up activities for your class. Students can apply what they learned during their visit by contributing to the Blogs, Discussion Boards, or Gallery. As a non-profit conservation association, Ocean Wise has a mission to inspire the global community to become Ocean Wise by increasing understanding, wonder and appreciation for our oceans. Through self directed visits you can create a one of a kind experience for your students, be it in topics about biology, ecology, community, business, visual arts, social studies, geography, english... the list goes on. Come and explore with your students. Who know what you might find!